Alfonso Morales is originally from New Mexico and his family has farmed and ranched in West Texas for more than 100 years. He interested in applying science to support society and various social goods. He studies food systems, public marketplaces, and street vendors, supports non-profit organizations, writes about entrepreneurship, and does a variety of outreach activities. 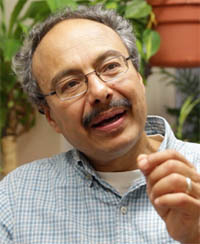 Professor Morales’ concept of the Wisconsin Idea as a social construct extends it as an abstract cohesion in intra-social and inter-social forces. A shared idea, shared ideals, a form of cohesion in thought or goal, a common frame of reference from which the individual can expand in various directions. What struck me about the application of this abstract idea was how a smoothly seamless cohesion can become so ubiquitous as to be invisible. This is how I personally experienced Madison when we first moved here. The very air was imbued with the spirit of cooperation, energy for art and music, and dedication to advancing science and education. The Madison energy, the heart of the Wisconsin Idea, presented a smorgasbord of possibilities for expansion of self – in art, in music, in science, in the general growth of self. It was the very air we breathe – it was very present, yet invisible. However, this course in its exploration of the history, purpose and effects of that Wisconsin Idea, has made that invisible, encompassing ether take solid form. It didn’t just “happen” – it was carefully crafted and brought to life by the people who supported and furthered the ideas it encompassed. It is a living thing that must be nurtured to survive. Must be tended and fed to grow. And it feeds on a positive interaction between peoples, an open-minded sharing of ideas and talents – it is that intra-personal and inter-personal cohesion that keeps the Wisconsin Idea alive and growing. Unfortunately, the force most inimical to the flowering of the Wisconsin Idea is mental closure: the shutting down of shared experiences, restriction of debated ideas, the death of tolerance. Like the very air we breathe is necessary to the activity of life, thus the shared social interactions is necessary for the activity of the mind.